The Department of Education (DepEd) encourages the Filipino students to join the Doodle 4 Google Philippines 2014 with the theme, “What can I do for the Philippines?”. This competition aims to involve Filipino students from both formal and informal schools in creating a new design of Google doodle that would be featured on Google Philippine’s homepage for 24 hours on November 2014 for millions of Philippines to enjoy. DepEd Secretary Br. Armin Luistro FSC said that DepEd supports Google Philippine Inc., in its aim to encourage Filipino youth to be creative both online and offline through Google 4 Doodle. Furthermore, he believed that this will be a way for learners to learn 21st century skills.The competition could enhance the ability of students to merge art, technology and patriotism. For those who are interested, joining as easy as one, two, three, since there are only three steps. You can start by downloading the Doodle 4 Google template. Step two is to print out the template and let the artistic side of you take charge. Third and final step is to submit the entry either online or through postal. All applications must be accompanied by a completed official entry form signed by the student’s parent or guardian. Take note that all forms must be complete or else you would be disqualified. Also, one person can only submit one entry. Postal address nearest you is posted on Google’official website. The judging criteria would be: artistic merit, creativity and theme communication. 400 doodles (100 in each age group) from all over the Philippines will be judged and receive Doodle 4 Google certificates. Ten finalists in each age group will be selected and invited to the award ceremony wearing a t-shirt with his or her doodle printed on it and get Doodle 4 Google goody bags. The 40 doodles will be posted on the website on October 6, 2014. 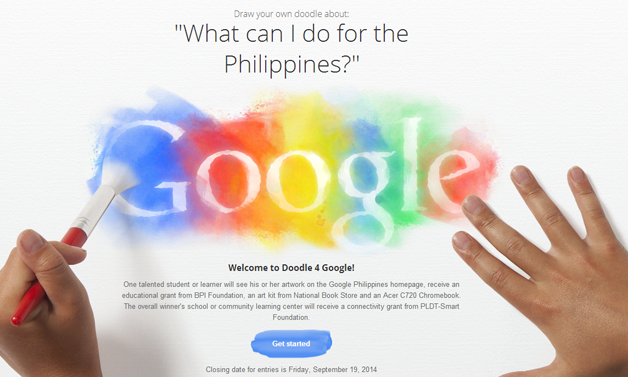 His or her doodle displayed on Google Philippines homepage for 24 hours on November 2014.